Obv: Bust of Elizabeth D.G. ELISABETA. AVGVSTA. OMN. ROSS. Elizabeth (Petrovna) (1709-1762), Empress of Russia from 1742 to 1762, was the daughter of Peter the Great and Maratha Skavronskaya (Catherine I, Empress of Russia). From 1730 to 1740, Elizabeth's cousin Anne was Empress of Russia. However in December of 1741, Elizabeth assembled her personal friends and members of her household, drove to the barracks of the Preobrazhensky Guards, enlisted their sympathies by a stirring speech, and led them to the Winter Palace. She seized the regent and her children in their beds, and summoned all the notables, civil and ecclesiastical, to her presence. Elizabeth had secured the ministers on her way to the Winter Palace, and the revolution was accomplished. 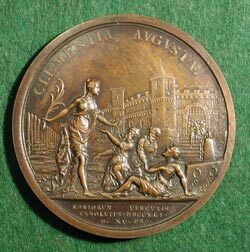 Shortly after she secured her position as Empress, she granted a general amnesty to the prisoners, the event commemorated by this medal. 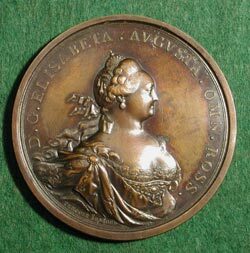 Later, Elizabeth waged war against Sweden, resulting in the annexation of part of southern Finland in 1743, and led Russia into the Seven Years' War (1756-1763). Elizabeth was a great patron of education and the arts, founding Russia's first university in Moscow in 1755.